Portable Solar Battery Charger – Innovative but Truly Functional? Battery packs are ubiquitous tools for everyone, not just the tech geeks. I reviewed this solar battery pack recently which on description, sounded rather interesting. It offered 5000mAh of power, recharges itself with solar energy, offers two 1A output for dual device charging and finally it’s waterproof so you don’t need to worry about damaging it while leaving it outdoors. It sounded like a perfect tool for the outdoor camper, able to sustain your electronic devices on long hiking trips thanks to the renewable solar cell. The ports are covered in waterproof rubber flaps. There are 4 led lights which help indicate the battery capacity and the first led will change to green colour to indicate solar charging. In addition, there’s a bright white led light which serves as an extra torch and a carabiner attached to clip onto your bag. Handy when outdoors. I had a few doubts and needed to verify the claims. For all it has been made out to be, solar energy has never really taken off. Efficiency and cost have always been issues that plagued adoption of solar energy and to circumvent them for a low cost battery pack might be too good to be true. You can read the store data description here. 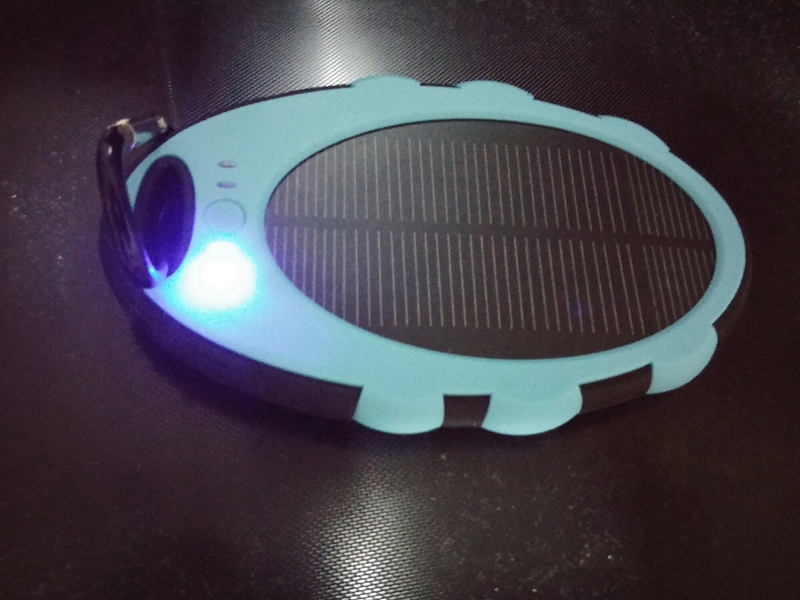 Water-proof YD-T011 5000mAh Solar Mobile Power Bank Solar Charger. First up, the battery pack was stated to offer 5000mAh which could theoretically juice up most phones with some extra to spare. I fully charged up the battery pack through a wall socket to eliminate any concerns on the solar efficiency and tested it charging the HTC E8 and LG G Pro 2 on separate occasions. The LG G Pro 2 was charged from 20% to 90% before the battery pack was flat. For the E8, it was able to push it from 10% to 95%. The G Pro 2 is a 3200mA size while the e8 is 2,600mA. I estimate that the battery pack is only capable of supplying 2300mA, which is a dismal 46% of its promised rating. This is in stark contrast to quality battery packs like Xiaomi which churns out above a 95% accuracy. The next claim was that it can be fully charged under strong sunlight within 13 hours. I left it outdoors for about 10 hours from 8am to 6pm under sunlight on a typical sunny day in Singapore. This was from an almost depleted one bar state. End of the day it was only showing two bar but a quick use quickly showed it dropping down to one. Disheartened, I left it outdoor again, this time for two days but the charged status never went up above two bars. So much for the ability to full charge in 13 hours. The water resistant feature did work but it’s likely not durable enough to survive a drop in a pool. I didn’t dare try. It’s a good idea to have a solar battery pack but this particular unit I got is poor on execution. 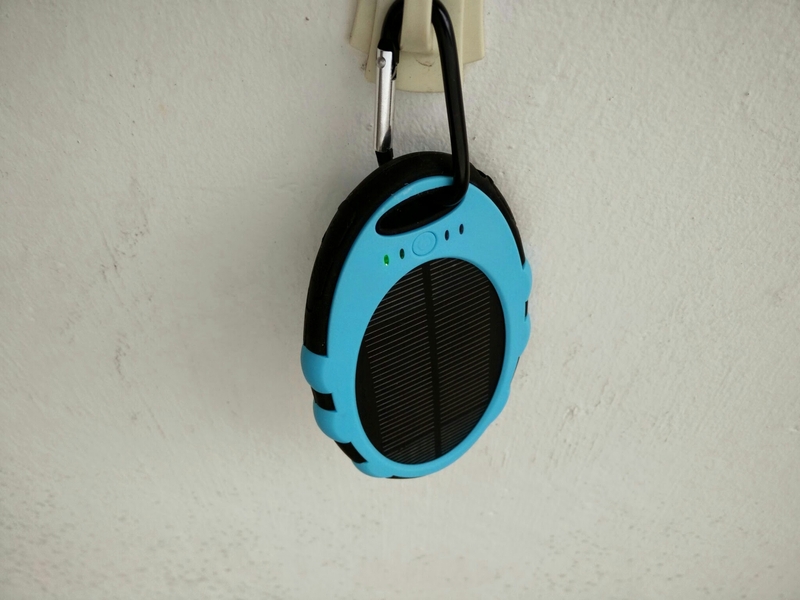 A quality outdoor solar battery pack should appeal to the hiking and camping enthusiasts but this is not the one.